Today’s ride: The Seagull Century is one of the largest cycling events in the country, drawing over 8000 riders to Salisbury on Maryland’s eastern shore. It’s been held for over 25 years, and it’s connection to Salisbury University makes it well staffed and supported. In many ways, 8000 riders create a critical mass of cycling culture. The event actually begins on a Friday, with shirt pickup, optional group rides around the area, and exhibits by vendors in the gym. It’s a time to build excitement, catch up with friends, and shop for items you may want for the next morning. The growth of ridership has created the need for three options; two century courses and a metric century. The Assateague Century Course runs south and then east to the coast, with a rest stop at Assateague Island at mile 60. It is the classic Seagull route. it was the first route and still the most popular, with the highlight being the chance to wade in the ocean and see the wild ponies that roam on Assateague Island. The Snow Hill Century was created several years ago. It has some common elements to the metric century, and runs south through the town of Snow Hill, riding past small rivers and inlets that are a feature of Maryland’s eastern shore. The Snow Hill course has the advantage of being much less crowded while being just as well supported. While I have never ridden the metric century (62 miles), some of that course is common to the Snow Hill Century route. The main feature of the Seagull courses is that they are flat as a tabletop. For some riders, who dislike climbing, this is a draw. I don’t see it as an advantage. Hills change your position on the bike, and therefore courses that have rolling terrain or climbs aren’t as hard on the places you contact the bike – hands, feet and seat. Hills also give you the opportunity to coast a little more and work slightly different muscle groups, while flat courses require you to apply power more consistently using the same primary muscle groups. The other main consideration for the Seagull is wind. I’ve ridden alone at the Seagull, and it’s much easier to have a friend to ride behind occasionally so you can rest out of the wind, but more about that later. it’s important to remember that a head wind is like a hill without a summit. 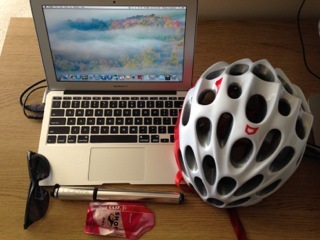 It is important to prepare for windy conditions at the Seagull Century. The Seagull is usually the first weekend in October, and while the mornings are usually cool, the day warms up quickly and many riders over dress at the start. It is a better idea to dress for mile 5, by which time you’re warmed up. Anything you would prefer not to have to carry for 95 miles should stay in your car. You won’t stay cool long. The Seagull Century was my first century ride. My experience isn’t uncommon – a lot of riders choose the Seagull as their first century, and in many ways it is an excellent choice. This is a very well supported ride. The Seagull is also a place where inexperienced riders congregate, and in many cases it is one of the few times all year that a rider will have a chance to ride in a group, much less a line. The sheer number of riders can be an issue, in the beginning where you can get in each other’s way, and on the open road where It can spawn a kind of “Tour De France” syndrome – where a rider will jump in with a fast pack and burn out, split a line, or form an ad hoc group made up of people who want to ride in a group to draft a little and save energy, but have no idea of how to behave in a group, or what to expect of the other riders around them. That can be very dangerous. I ride with a group of friends who are experienced group riders. We ride together all year, so often that we know what to expect of each other. We’ve learned what to do and what NOT to do, at the front (pulling) at the back, and within our line. We signal each other, call out hazards, pass information down the line as we slow or stop, and call out traffic. We stay together and ride consistently and predictably. This requires experience and practice. It only LOOKS easy. There is a lot of information available about drafting and pace lining, so I won’t write a lot more about it now, but suffice it to say that some of the best and worst examples of how to behave in a line of riders will be on display at the Seagull, and it’s a good idea to know how to ride in lines and approach them with respect, and better still, to ride only with people you know and trust. The Seagull finishes on the Salisbury University campus, and riders go through a tunnel under Route 13, past the beer garden tents, and under the finishing banner. Riders finish to the cheers of an enthusiastic crowd and live music. The beer garden itself, with a band and a general air of celebration, is a feature of the ride that adds much to the experience. 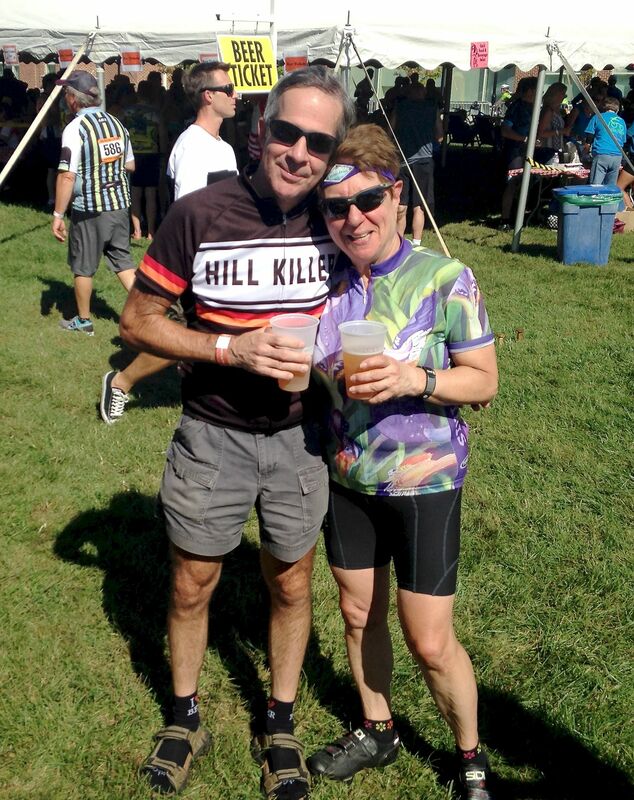 There are options other than beer to drink of course; but the atmosphere at the finish of the Seagull Century is an experience to look forward to in itself. The Experience: 2014 was a very organized Seagull for my teammates and I. We had reservations for dinners on Friday and Saturday, and a meeting place where we could all get together and ride out on the Seagull course together. We all chose to ride the Snow Hill century, since the course was better shaded, less crowded, and the lines for water and gatorade were not so very long. However, every Seagull is crowded at the start and finish, and choosing a good meeting place is important. It seems as though most riders meet up in front of the gym – we chose not to do that, since it was the cycling equivalent of a sticky trap – there are so many people waiting there that it is difficult to move past the gym at all. We all met up at the far side of the tunnel across the street, which worked much better. This was my 9th consecutive Seagull Century. I’d ridden it every year since my first Century in 2006. We rolled out onto the course well before 7:30, and starting early means you spend more time riding while the temperature is most comfortable. It was a cool and sunny day with a little wind, but not a hard wind. Perfect conditions. Carol Linden started out briskly, looking for a comfortable gap between knots of riders, and we stayed together behind her for the most part until those knots of riders thinned out a little. I was feeling very good, and so when the ride opened up, I went to the front and took a long pull, setting a steady pace for our line. We had a big group to start, with myself, Carol, Ron Tripp, Eric Sanne, Rita Spence, Rita Bell, Russ Altemose, Carmen Legato and John Koehnlein. I called to other friends as we passed, and the miles started slipping under our wheels smoothly at what seemed a far faster pace than we were actually riding. We passed fields and farms, and even a big Blue Heron at a pond at the roadside, and we were at the first rest stop at the 20 mile mark while still feeling comfortable and strong. At the first stop we split up with John, who was looking to ride at a faster pace, and Russ, who had agreed to ride with us to the first rest stop and then take up with some other riders for the remainder. 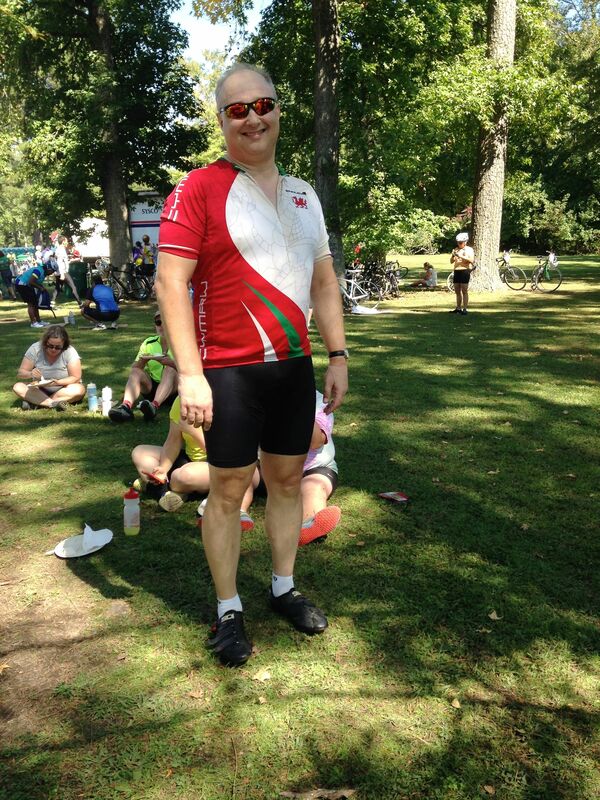 Russ is recovering from cancer, and riding 100 miles at the Seagull was a big step for him. Riding a slower pace was sensible for him, since he had less time to train. Riding that 100 was a triumph for him though, and we were all glad to share in it. After the first stop, the Snow Hill course sent us away from the other rides for the most part, and we continued at a good comfortable pace. We had picked up some riders at the end of our line, but they turned out to be very considerate, and members of our home club, Potomac Pedalers, though we hadn’t met them. They let us in front of them as we came back off of the front of the line, and drafted politely behind our line. When we got to the next stop, they complimented us on our line. The water stop by the Pocomoke River wasn’t crowded, and we made it a short stop and headed out toward Snow Hill with good cheer all around. By the time we got to Snow Hill, the only real problem among us became obvious. Ron was getting a click in the bottom bracket of his bike – a potential problem with the bearings. The park at Snow Hill was a great place to rest, and we took full advantage, enjoying cranberry and blueberry pound cake and filling up our bottles. We headed out again as the day began to heat up. This was the longest leg of the ride, but even as the day warmed up, we remained comfortable. By the time we had ridden 70 miles, it was obvious that Ron’s bike was getting worse. He abandoned at mile 75, before the final rest stop at Nassawango Golf Course. In the meantime, it was obvious to me that I was still riding strong, and so were Eric and Carol. The final rest stop was welcome for the pie and ice cream, though we were sad to see Ron waiting for a ride back to the University. The final leg joined the Metric course, and we overtook a lot of riders as Eric, Carol and I took turns pulling the line back to Salisbury. I rode in strong, feeling the joy of completing one of my best Seagull Centuries ever. The celebration in the Beer Garden afterward was exceptional. Eric and I spent some time cheering for riders coming out of the tunnel, hoping to see Russ finish, but he slipped in before we got to the rail. We cheered for everyone anyway. One of the things that make the Seagull unique is the cheering crowd at the finish, and being part of that made me feel good. With the exception of Ron’s mechanical problem, we all had a good ride, and my 10th century of 2014 was one of the most memorable. Selections from my mental iPod during the ride: “Poor, Poor Pitiful Me” by Warren Zevon, “Just Like Heaven” by The Cure, and “Cynical Girl” by Marshall Crenshaw. Stats: 101.59 Miles ridden. With a combination of ideal weather conditions and feeling strong all day, and with good friends to share the experience, this was a ride to remember. 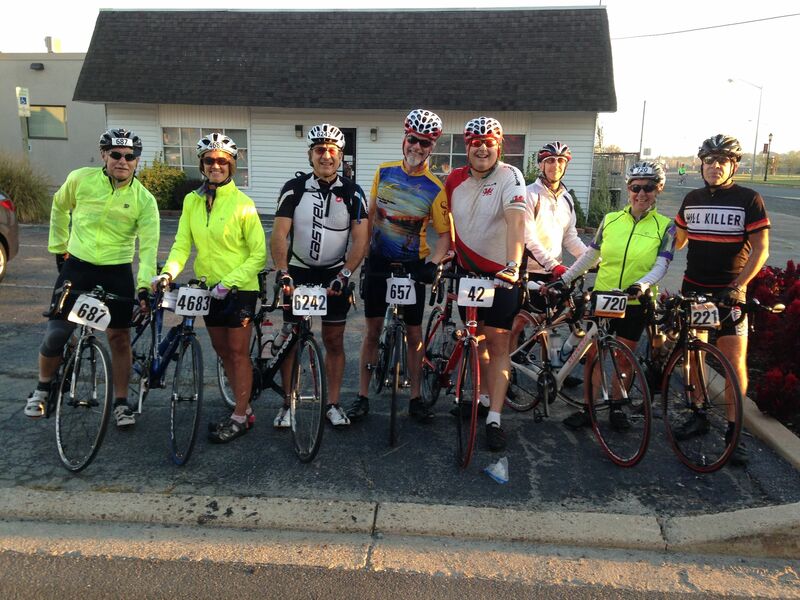 My teammates on this ride – Ron Tripp, Rita Bell, Carmen Legato, Eric Sanne, myself, Russ Altemose, Carol Linden and John Koehnlein. 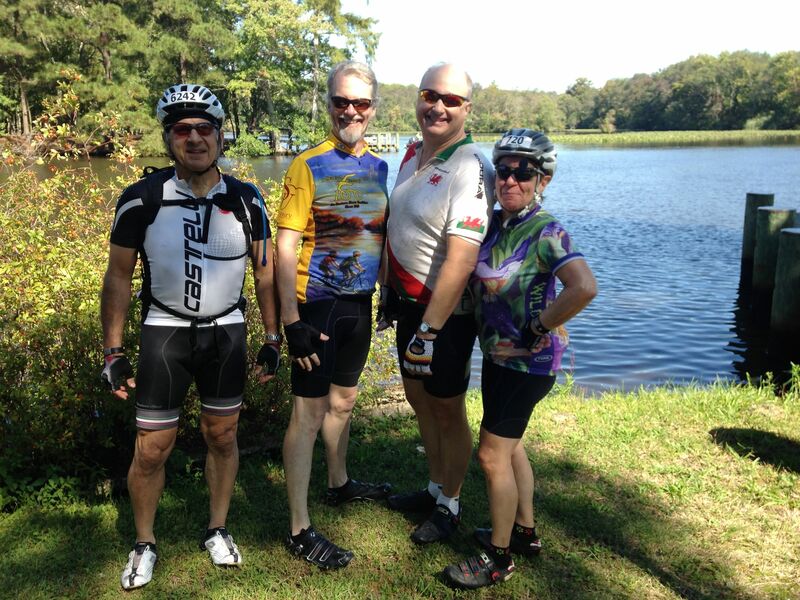 Carmen, Eric, myself and Carol at the Snow Hill rest stop. At the final rest stop. John and Carol in the Beer Garden post-century. Relaxing in the Beer Garden after a terrific ride. 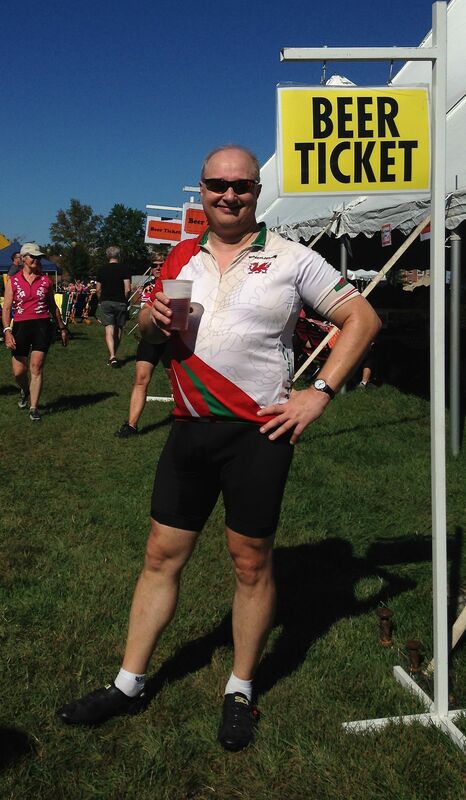 This entry was posted in Cycling and tagged century, Cycling, Seagull Century on October 1, 2014 by kitefencer. we couldn’t have had a more perfect day for riding. dave & rad completed their first metric & i rode my first century. i preferred to ride the snow hill route because it would be less crowded & i could ride the first portion of the metric w/ rad & dave. i didn’t ride as many big miles as i wanted to leading up to the seagull. i think it showed & by the end i was exhausted but triumphant. we are already talking about next year & looking forward to another riding season. there will be plenty of bragging this winter. Couldn’t agree more. It’s a ride where you have to be generous of spirit as so many new riders form lifetime impressions based on their experience here. Cheering incoming riders is a must for all concerned.